Today's post is about the wonder of the Internet. Sure you hear horror stories, but I'm going to share with you the story of an Internet experience that went wonderfully RIGHT. Not knowing where to start, I googled "Philadelphia magician teach" and after checking out some not-so-great sites, came to the website of Magician Francis Menotti. He seemed to fit the bill, so I emailed him. He said teaching magic to kids at parties was something he did, we picked a date and that was that. Well, weeks went by and I started to think, "Huh, it couldn't be that easy, could it?" On Saturday I found out - it was! I cannot recommend Magician Francis Menotti highly enough. 'Nuff said. Tomorrow, back to baseball and knitting. Dude. Best party ever!!! Ten gold mom starts for you! he looks a little scary but if anything happened, there are more of them than him. they could take him out lol. and did i tell you a woman came in the store, picked through my & the other girl's bags and saw my TYC and got the SAME EXACT color and is gonna knit it? my project got jacked. He was totally not scary (and I'm a little uneasy about all magicians!) It was a great party and the kids loved it! It was worth driving 4 hours in the monsoon! lizk - thankee. those moments of triumph seem few and far between, so i am savoring this one for sure!! 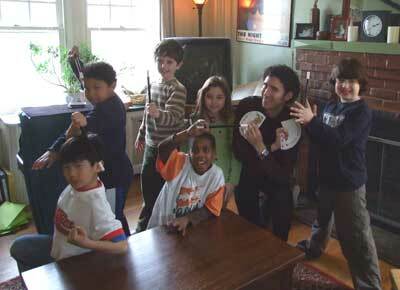 jjp - plus all the kids have magic wands, so theoretically their combined power could do some real damage. Re your jacked TYC: we had 20 KALers and only had 2 ladies that did the same color. weird. cg - thank you for all your help, especially on the mighty Pigs In A Blanket Quest.